Sadly – though as expected – the most powerful far-infrared orbital telescope put in orbit has ended mission. The Herschel space observatory has now run out of liquid helium coolant, ending more than three years of pioneering observations of the cool Universe. The spacecraft needs to be at temperatures as low as 0.3 Kelvin, or minus 459 degrees Fahrenheit to make its observations, and mission scientists and engineers knew since Herschel’s launch on May 14, 2009 that the 2,300 liters of liquid helium would slowly evaporate away. The Herschel team sent out a notice that the helium was finally exhausted today, noted at the beginning of the spacecraft’s daily communication session with its ground station in Western Australia. The data showed a clear rise in temperatures measured in all of Herschel’s instruments. “Herschel has exceeded all expectations, providing us with an incredible treasure trove of data that that will keep astronomers busy for many years to come,” said Alvaro Giménez Cañete, ESA’s Director of Science and Robotic Exploration. The Herschel telescope will be parked indefinitely in a heliocentric orbit, as a way of “disposing” of the spacecraft. It should be stable for 100s of years, but perhaps scientists will figure out another use for it in the future. One original idea for disposing of the spacecraft was to have it impact the Moon, a la the LCROSS mission that slammed into the Moon in 2009, and it would kick up volatiles at one of the lunar poles for observation by another spacecraft, such as the Lunar Reconnaissance Orbiter. But that idea has been nixed in favor of parking Herschel in a heliocentric orbit. What has Herschel done in its three years of observations? It has made over 35,000 scientific observations, amassing more than 25,000 hours’ worth of science data from about 600 different observing programs. A further 2,000 hours of calibration observations also contribute to the rich dataset, which is based at ESA’s European Space Astronomy Centre, near Madrid in Spain. But there will be more news the future from Herschel’s observations, as scientists comb through the data. The Herschel team said today that the telescope’s data is expected to provide even more discoveries than have been made during the lifetime of the Herschel mission. “Herschel’s ground-breaking scientific haul is in no little part down to the excellent work done by European industry, institutions and academia in developing, building and operating the observatory and its instruments,” saids Thomas Passvogel, ESA’s Herschel Program Manager. “Herschel has offered us a new view of the hitherto hidden Universe, pointing us to a previously unseen process of star birth and galaxy formation, and allowing us to trace water through the Universe from molecular clouds to newborn stars and their planet-forming discs and belts of comets,” said Göran Pilbratt, ESA’s Herschel Project Scientist. One of the predictions of Einstein’s predictions from general relativity was that gravity could distort space itself and potentially, act as a lens. This was spectacularly confirmed in 1919 when, during a solar eclipse, Arthur Eddington observed stars near the Sun were distorted from their predicted positions. In 1979, this effect was discovered at much further distances when astronomers found it to distort the image of a distant quasar, making one appear as two. Several other such cases have been discovered since then, but these instances of gravitational lensing have proven difficult to find. Searches for them have had a low success rate in which less than 10% of candidates are confirmed as gravitational lenses. But a new method using data from Herschel may help astronomers discover many more of these rare occurrences. The Herschel telescope is one of the many space telescopes currently in use and explores the portion of the spectrum from the far infrared to the submillimeter regime. A portion of its mission is to produce a large survey of the sky resulting in the Herschel ATLAS project which will take deep images of over 550 square degrees of the sky. While Herschel explores this portion of the electromagnetic spectrum in far greater detail than its predecessors, in many ways, there’s not much to see. Stars emit only very faintly in this range. The most promising targets are warm gas and dust which are better emitters, but also far more diffuse. But it’s this combination of facts that will allow Herschel to potentially discover new lenses with improved efficiency. Already, this new technique has turned up at least five strong candidates. A paper, to be published in the current issue of Science discusses them. Each of them received followup observations from the Z-Spec spectrometer on the California Institute of Technology Submillimeter Observatory. The furthest of these these objects, labeled as ID81, showed a prominent IR spectral line had a redshift of 3.04, putting it at a distance of 11.5 billion lightyears. Additionally, each system showed the spectral profile of the foreground galaxy, demonstrating that the combined light received was indeed two galaxies and the bright component was a gravitational lens. This method of using gravitational lenses will allow the Herschel team to probe distant galaxies in detail never before achieved. As with all telescopes, longer wavelengths of observations result in less resolution which means that, even if one of the distant systems were to be broken into distinct portions, Herschel would be unable to resolve them. But the fact that we can see them at all means their spectral signatures of the galaxies as a whole can still be studied. Additionally, as Professor Steve Eales from Cardiff University and the other leader of the survey noted: “We can also use this technique to study the lenses themselves.” This potential to explore the mass of the nearby galaxies may help astronomers to understand and constrain the enigmatic Dark Matter that makes up ~80% of the mass in our universe. Researchers studying Neptune’s atmosphere found evidence that a comet may have hit the planet about two centuries ago. Was this a “cold-case” file re-opened, or did they discover a way to travel back in time to witness a long-ago event? To make the discovery, a team from the Max Planck Institute for Solar System Research actually used the Herschel Space Telescope’s PACS (Photodetector Array Camera and Spectrometer) instrument, along with what was learned from observations from when the Shoemaker-Levy 9 hit Jupiter sixteen years ago. Wow. Just wow. Each of the colored dots in this new image from the Herschel telescope is a galaxy containing billions of stars. These are distant luminous infrared galaxies, and appear as they did 10–12 billion years ago, packed together like grains of sand on a beach, forming large clusters of galaxies by the force of their mutual gravity. “These amazing new results from Herschel are just a taste of things to come, as Herschel continues to unlock the secrets of the early stages of star birth and galaxy formation in our Universe,” said Dr. David Parker, Director of Space Science and Exploration at the UK Space Agency. The galaxies are color coded in blue, green, and red to represent the three wavebands used for Herschel’s observation. Those appearing in white have equal intensity in all three bands and are the ones forming the most stars. The galaxies shown in red are likely to be the most distant, appearing as they did around 12 billion years ago. For more than a decade, astronomers have puzzled over strangely bright galaxies in the distant Universe. These luminous infrared galaxies appear to be creating stars at such phenomenal rates that they defy conventional theories of galaxy formation. Now ESA’s Herschel infrared space observatory, with its ability for very sensitive mapping over wide areas, has seen thousands of these galaxies and pinpointed their locations, showing for the first time just how closely they are sardined together. The science teams from the Herchel telescope are meeting this week to discuss their first results from the intial months of observations by the newest infrared space telescope, which was launched in May. While details of the scientific findings won’t be released until Friday after everyone at the meetings has had a chance to share their results, ESA released a few stunning new pictures to give everyone a sample of what is to come. In addition to the images shown here, hints of other upcoming images include the most distant known quasar, a dwarf planet, and water sublimating from a comet’s surface. Some of the images have been described as among the most important images obtained from space for decades. Above, Herschel peered deep inside an unseen stellar nursery in located 1000 light years away in the constellation Aquila, the Eagle, revealing a surprising amounts of activity. Some 700 newly-forming stars are estimated to be crowded into filaments of dust stretching through the image. 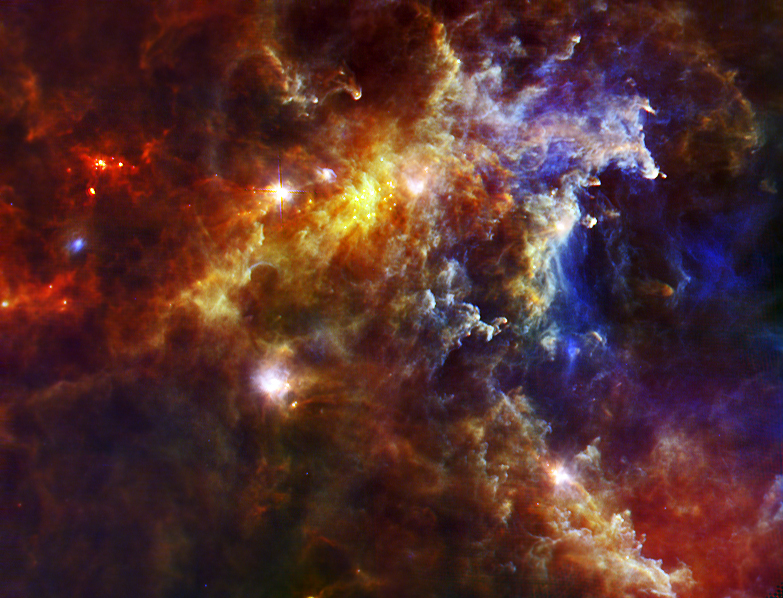 The image is the first new release of ‘OSHI’, ESA’s Online Showcase of Herschel Images. Another images release of the Southern Cross shows that even the darkest patches of sky can shine brightly to Herschel. Usually, this region looks like a bland cloud of dust, but Herschel shows it to be a place of intense star formation with filaments and condensations of dust cocooning newly forming stars. The dust forms into clumps along magnetic lines – like pearls on a necklace. Each clump is a very early star – at its embryonic stage. The third image is of the spiral galaxy M51, also known as the Whirlpool Galaxy, showing off its spectacular infrared colors. Two huge waves of star formation encircle its central nucleus, making beautiful spiral arms. Each one shines brightly with its dust being warmed by the young stars.